Tonner, Phyn & Aero, Commemorative Nancy Ann, P17NADD01. 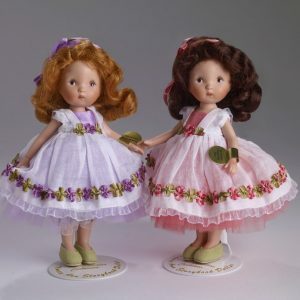 One of the most darling Nancy Ann dolls! Nancy Ann wears a pink and white dotted swiss dress with ribbon and braid trim, accented by a tiny ribbon rose. The underskirt of the dress is made of the tiniest pink and white check trimmed with white lace. The little six-inch tall porcelain doll with hand painted features wears a Tosca mohair wig with an oversize pink check bow. To finish her look, she has white Mary-Jane shoes and white ruffle socks. 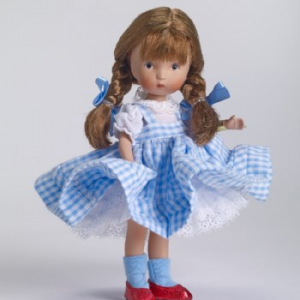 Just like all our Nancy Ann dolls, she has a gold foil wrist tag and a perfect fit doll stand.